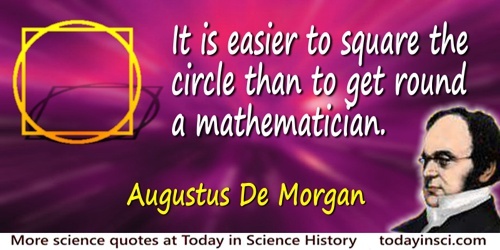 English mathematician and logician who did important work in abstract symbolic logic, the theory of relations, and formulated De Morgan's laws. Considerable obstacles generally present themselves to the beginner, in studying the elements of Solid Geometry, from the practice which has hitherto uniformly prevailed in this country, of never submitting to the eye of the student, the figures on whose properties he is reasoning, but of drawing perspective representations of them upon a plane. ...I hope that I shall never be obliged to have recourse to a perspective drawing of any figure whose parts are not in the same plane. Quoted in Adrian Rice, 'What Makes a Great Mathematics Teacher?' The American Mathematical Monthly, (June-July 1999), 540. I don't quite hear what you say, but I beg to differ entirely with you. I was x years old in the year x2. When asked about his age (43). Quoted in H. Eves, In Mathematical Circles (1969). It was long before I got at the maxim, that in reading an old mathematician you will not read his riddle unless you plough with his heifer; you must see with his light, if you want to know how much he saw. Letter to W. R. Hamilton, 27 January 1853. In R. P. Graves (ed. ), A Life of Sir W. R. Hamilton (1889), Vol. 3, 438. Metaphysics. The science to which ignorance goes to learn its knowledge, and knowledge to learn its ignorance. On which all men agree that it is the key, but no two upon how it is to be put into the lock. Lest remark in letter to Dr. Whewell (25 May 1850), collected in Sophia Elizabeth De Morgan (ed. ), Memoir of Augustus De Morgan (1882), 210. From Matter to Spirit, Preface. The examples which a beginner should choose for practice should be simple and should not contain very large numbers. The powers of the mind cannot be directed to two things at once; if the complexity of the numbers used requires all the student’s attention, he cannot observe the principle of the rule which he is following. In Study and Difficulties of Mathematics (1902), chap. 3. The gambling reasoner is incorrigible; if he would but take to the squaring of the circle, what a load of misery would be saved. Quoted in D. MacHale, Comic Sections (1993). The imaginary expression √(-a) and the negative expression -b, have this resemblance, that either of them occurring as the solution of a problem indicates some inconsistency or absurdity. As far as real meaning is concerned, both are imaginary, since 0 - a is as inconceivable as √(-a). Quoted in Robert Perceval Graves, Life of Sir W. R. Hamilton, Vol. 3 (1889), 219. The sacred writings excepted, no Greek has been so much read and so variously translated as Euclid. In Article 'Eucleides', in Smith, Dictionary of Greek and Roman Biology and Mythology (1902). A footnote adds: Riccardi, Bibliografia Euclidea (1887), lists nearly two thousand editions. The thirteen books of Euclid must have been a tremendous advance, probably even greater than that contained in the Principia of Newton. In Article 'Eucleides', in Smith, Dictionary of Greek and Roman Biology and Mythology (1902). 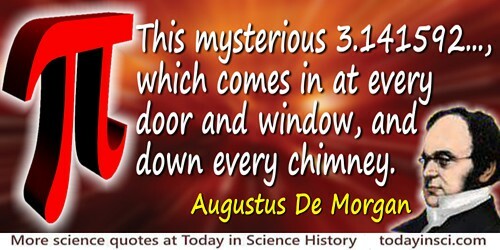 This mysterious 3.141592..., which comes in at every door and window, and down every chimney. We know that mathematicians care no more for logic than logicians for mathematics. The two eyes of science are mathematics and logic; the mathematical set puts out the logical eye, the logical set puts out the mathematical eye; each believing that it sees better with one eye than with two. Note that De Morgan, himself, only had sight with only one eye. Review of a book on geometry in the Athenaeum, 1868, Vol. 2, 71-73. 27 Jun - short biography, births, deaths and events on date of De Morgan's birth. Memoir of Augustus De Morgan, by Sophia Elizabeth (Frend) De Morgan. - book suggestion. Booklist for Augustus De Morgan.